Without compromising his superb comedic timing and vibrant portrayals of country folk, Peck (A Long Way from Chicago; A Year Down Yonder) reaches new depth with this Civil War–era novel. Structured as a framed story, the book begins in 1916, as 15-year-old Howard Leland Hutchings travels from St. Louis with his father and young twin brothers to visit their Grandma Tilly, a lifelong resident of Grand Tower, situated on the Mississippi River at the southern tip of Illinois. The narrative then shifts to the dawning of the Civil War, as Howard's grandmother recounts to him the family's history. 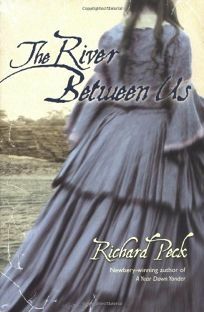 A then-15-year-old Tilly brings images of a divided state and country to life as she tells of the arrival of a Southern belle, Delphine, traveling by ship with the woman they presume to be her slave, Calinda, in April 1861. Delphine causes a stir in town with her fancy airs and extraordinary sense of fashion. Acting more charitably than most of her neighbors, Tilly's mother opens her home to the stranded New Orleans natives. Peck crafts his characters impeccably and threads together their fates in surprising ways that not only shed light on them but also on the complicated events and conflicts in America at that time. Tilly's younger sister, Cass, often has "visions" of the past but then begins to see images from the future as well ("Boys, blown apart, blue and gray"). Her ability draws her to Calinda, who shares a similar gift. Tilly is in awe of both guests ("I didn't know what to make of that great world she come from, but she made me want more in my small one"), and her twin brother, Noah, becomes smitten with Delphine. Although Delphine initially comes across as a Blanche Dubois type, her strength amazes and inspires everyone when the war begins to take its toll. Even the twins' mother blossoms from Delphine's proximity ("She put some starch in my spine," Tilly's mother says). These relationships cement and then reverberate throughout the novel. A showboat's arrival on the Mississippi, and Tilly and Delphine's trip to the battlefront in search of Noah, occasion further revelations about Delphine and Calinda's background as well as fascinating details of the complex New Orleans society. Through Tilly's conversational narrative, the author also introduces the significance of Bull Run and the Battle of Belmont. Without graphic description, Peck does not shy away from the horrors of war, nor how it divided the families and friends of Grand Tower.